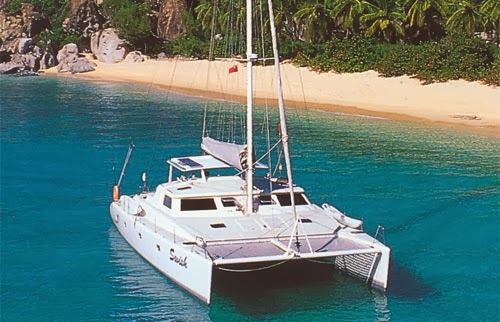 Luxury Catamaran Swish. Enter the realm of peace and tranquility... on board our luxury catamaran, where the main objective of the professional crew is to ensure your idyllic vacation. Sail away to adventures untold... at a relaxed pace - the stability of the twin hulls offers the highest degree of comfort while underway, or while at anchor. An exhilarating sailing experience for novice and professionals - especially when enjoyed between the pontoons - on the oversized trampolines!.. Attention to detail is obvious in the custom designed interior. Elegant appointments in the airy saloon - a room with beautiful views. This includes: Chilled bottle of Moët & Chandon Champagne in your cabin upon arrival.